Recently, thanks to some dirt cheap flights from Frontier Airline, a friend and I spent a few days in a beautiful beach town in Southern California. Just off the coast of San Diego, Coronado sounded like the perfect place for a weekend, girls getaway. Once we booked our flights, the search was on for the perfect hotel. Our search led us to Glorietta Bay Inn, a beautiful mansion first belonging to the former owner of the famous Hotel Del Coronado. John D. Spreckels is pretty famous around Coronado and the San Diego area as a whole. After all, he was all but Coronado’s founding father and one of the most influential men in the development of a desolate San Diego into the booming cosmopolitan we know today. He was an incredible visionary and invested much of his time and wealth into an area he adored and called home for nearly 20 years. Though he held a few investments in constructions companies along the San Diego wharf, the real story begins when he invested half a million dollars with the Coronado Beach Company, developers of the Hotel Del Coronado. Long story short, by 1890, Spreckels controlled the hotel and he remained the owner until his death in 1926. The hotel was one of many acquisitions and investments that Spreckels made into the city. Others include the newspaper, the rail system, the ferry system and the entire North Island. In fact, at one point, he owned all but 5 parcels of land between Coronado and North Island! Why to Glorietta Bay Inn? Booking a stay at The Del was tempting but I learned about Glorietta Bay Inn and it’s history, I couldn’t pass up the opportunity. I’m a sucker for historic places and I thought, “If this man was part of the development of the Hotel Del Coronado and this mansion was his dream home, it’s bound to be beautiful!” Beautiful, it was! Almost a year ago to the date, I was in Italy and the architecture of this home brought back memories of Tuscany. Apparently, Mr. Spreckels had a flair for Italian Renaissance and the home shows it! Original marble staircase upon entrance. Before I go any further, I’d like to be transparent. I am NOT receiving payment for this piece. I was, however, provided a discount on our stay in exchange for my honest review. As always, the following opinions are 100% my own. First impressions set the tone for most experiences. I really feel like the staff at Glorietta Bay Inn hit the nail on the head for this one. First of all, our day started at 2:30 in the morning to catch an early flight. Basically, I arrived one tired and hungry hot mess. Exhaustion I can deal with but hungry can become a problem. When we walked into the hotel, it wasn’t even 9 am yet so I was a little anxious about how much longer I had to wait to eat. My expectation was to let them hold our bags while we searched out some breakfast and return a little later. My hope was that they let us check in a few hours early to maybe take a nap after lunch. Upon entry, we were greeted warmly. I mean, seriously, this woman was an angel. I don’t recall her name but she was as sweet as could be. The first bonus was when she let us know that our room was ready. What a relief knowing we could go ahead and relax for a few minutes and freshen up! The second bonus was the invitation to help ourselves to breakfast. Maybe she saw the desperation in my eyes. Lol! First impression? Check! Settling into the room and being able to freshen up before a long day was a relief. I don’t generally require much from a room aside from a working A/C (or heater), a coffee maker and a decent bed. I do, however, always appreciate when I find them to be spacious. Double bonus when the bathroom isn’t the size of the hall closet! While the room was well equipped with all the necessities and then some, I do think something could be done to brighten up the space. Even some curtains and some minimal deco would go a long way. Of course, this isn’t a make or break for me but I think for some people it makes a difference. The room itself had a little bit of a dorm room feel rather than the cozy feel one might expect from a boutique hotel. That said, I was content because I am not one to spend much time in a hotel room anyway. I think the rooms inside the mansion may be staged differently and appear more like a home; however, I can’t be sure because I didn’t go inside any of them. Here are a few images of our room. TV positioned to the side with a swivel mount. Kitchenette with mini-fridge, microwave, and coffee bar. Dual vanity and separate bathroom with shower. Everybody wants to know what they can expect from a hotel without additional charges. There’s nothing quite like settling in and figuring out you have to pay an extra $10/day just to flip on the TV before bedtime (yes, that has happened) or, worse, discovering there is no coffee pot as you try to peel your eyes open after waking up (yes, that has also happened). Here’s a rundown of the complimentary services offered by the Glorietta Bay Inn. Guests can log in to WIFI at no charge and it actually works very well! I had no connection issues for the duration of my stay. A simple, but satisfactory breakfast is available for each morning of your stay. The breakfast room is full of various pastries, fresh fruits, boiled eggs, pancakes, and a variety of cereals along with an oatmeal bar. Water, coffee, and a few different juices are also available. You can enjoy your breakfast in the music room or outside on the terrace with the ocean in the distance. Lemonade and gingerbread cookies are available in the breakfast room each day between 3:00 and 5:00. It’s a nice little refreshment if you find yourself back at the hotel during the afternoon. If the ocean water is too cool for you to take a dip in, you can take advantage of the hotel’s heated pool. It’s outdoors near the sunny south entrance of the mansion. Many pool supplies and toys are available from the hotel. Glorietta Bay Inn is literally right across the street from Coronado Beach so a walk over is only about 5 minutes. If you don’t mind schlepping your own stuff around, you can save some cash by loaning chairs and an umbrella from the hotel. Glorietta Bay Inn will provide them for your use along with beach towels, just don’t forget to bring it back! The alternative is renting beach chairs once you get to the beach. Personally, we borrowed some towels and made do. 3C and North Island at sunset. Why You Should Stay at Glorietta Bay Inn. All in all, this was a great place to stay. The hospitality was on point and that’s something that I happen to believe separates the great hotel stays from the memorable ones. My fondest hotel memories always involve an exceptional staff. Let’s face it, it feels good to feel like someone really cares and appreciates your decision to stay there. I can honestly say that we never passed by a staff member whether in the lobby or on the grounds without being on the receiving end of a smile and a warm greeting. Everybody was SO nice and we always felt well taken care of. If I were heading back, I’d absolutely stay at Glorietta Bay Inn. The experience as a whole was well above average and I appreciated the charm. We met a few different people around town and it was nice to keep hearing from the locals that Glorietta was hands down the best place in town. It’s small in comparison to the Hotel Del Coronado across the street. 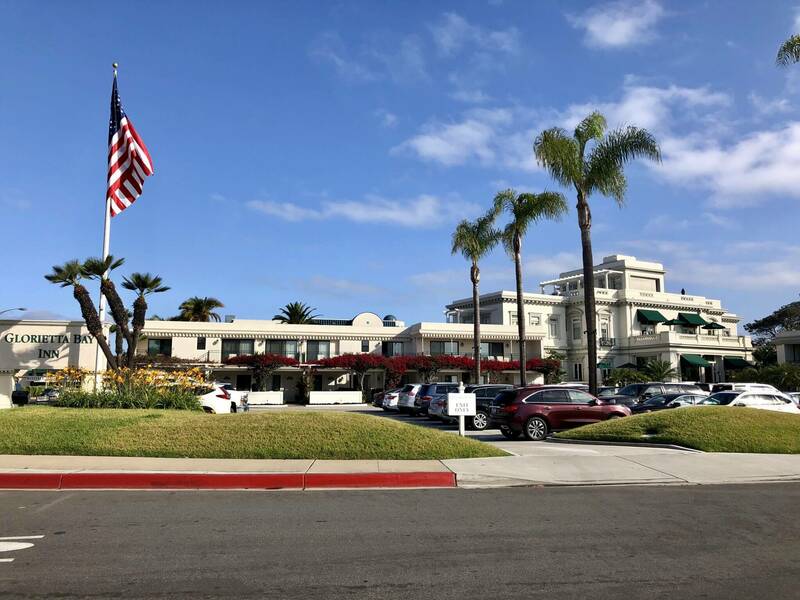 In all honesty, I had to wonder what it was like to stay in the massive and stunning complex that is “The Del.” Maybe someday I will but, for now, I love that I chose the Glorietta Bay Inn and I hope you give it a try too. I can already imagine myself relaxing in the music room and reading a book after a long day. Then, enjoying the outdoors the next morning on the breakfast terrace. I love the history you provided in the article too! Sounds like a great place to stay. The DEL is very pricey and I will keep this in mind for the future (by pinning).